Heavy Duty Retractable Reels with Multi-Function Attachment Capability. 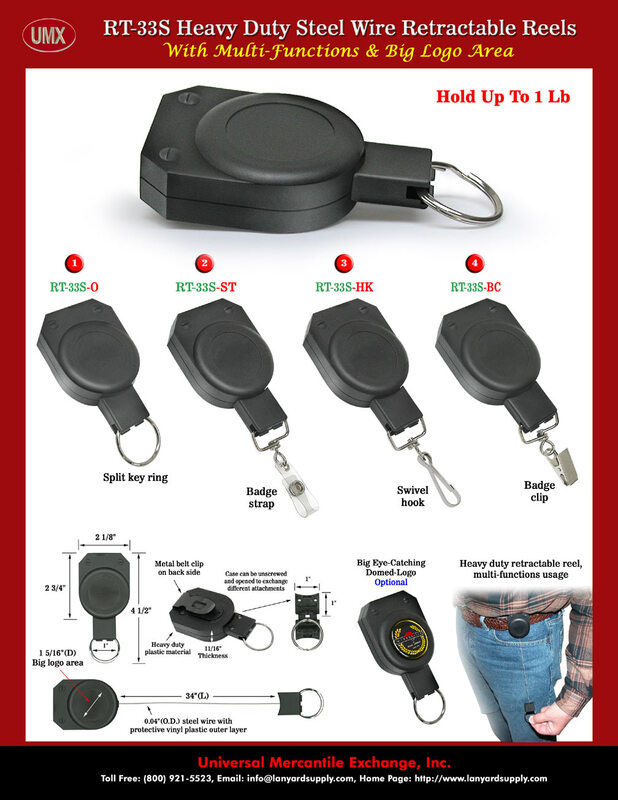 Special designed to retract heavy weight objects, like hanging heavy weight display, electronic device, cell phone, small tool, keychain, or ID card name badge holder. With key-rings ( keyring, key chain ) and heavy duty belt clips on the back. The heavy duty durable metal steel wire is wrapped with vinyl plastic layer to provide protection. A big custom logo area are great for eye-catching custom logos, they can be silk screen imprinted or laser cut sharp logos with domed cover. You are viewing Lanyards > Badge Reels > Retractable Reels For Heavy Weight Retract - Hold Up 1 Lb.